Connect with patient-focused, involved medical professionals who work in teams with physicians. 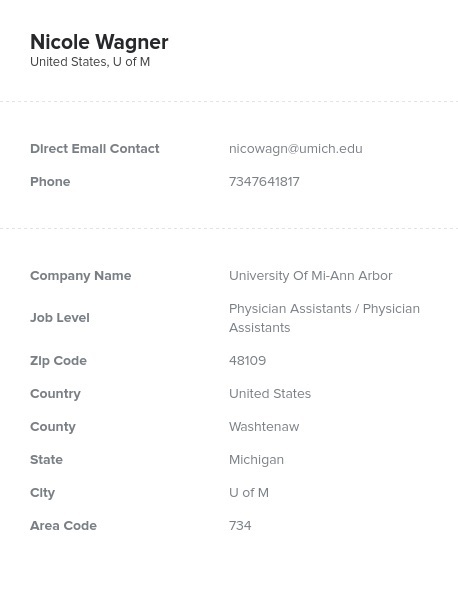 Find physician assistants (PAs) easily with this specialized email list containing all of the information you need to connect: emails, addresses, names, numbers, titles, and more! Offering qualified, supportive, and knowledgeable care to patients, physician assistants extend the reach of busy doctors while being able to treat and tend to many situations themselves. Under the supervision of a doctor or surgeon, these highly educated individuals treat and prevent illnesses while providing more involved, one-on-one care to a patient. Depending on state laws, they may also recommend certain prescriptions and treatments. They often have a master's degree, along with several licenses. They work hard to take care of their patients within hospitals, offices, or clinical settings. Buy our complete physician assistant email database if you want to market your relevant product or service to a unique and qualified group of health experts. You can use this list to market a variety of things, from medical supplies, like masks and gloves, to pharmaceuticals, over-the-counter remedies, or medical journals and magazines. This PA email list is useful in a variety of pharmaceutical and medical marketing campaigns and can help you boost sales and reach out to more health-care influencers. Download this pre-built list today to connect with physician assistants. Mailing lists from Bookyourdata.com can be purchased as a pre-built list, like this one, or you can buy a customized list by creating your own unique list of qualified sales leads with the B2B marketing list-builder tool. Either way, you can email leads who would be able to help your business. Connect with physician assistants with this list, which is ready for you to use now!